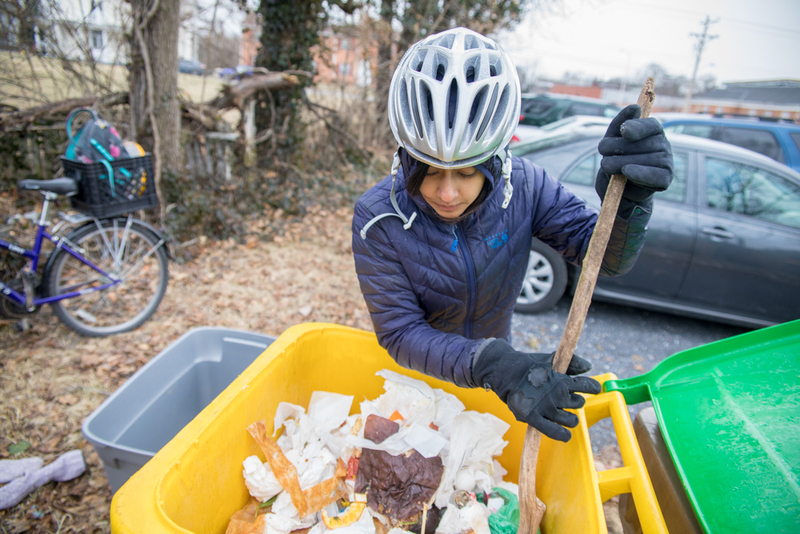 Globe-trotting environmental sustainability major and Eastern Mennonite University senior Nidhi Vinod has started a Harrisonburg service – collecting compost by bicycle – that embodies the values she has come to embrace over her years of learning. 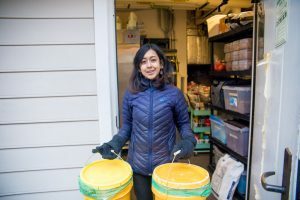 Since its first pickup on May 3, Vinod and her Soil Cycles team have biked 529 miles to collect 1,461 pounds of compost, preventing 2,749 kg of carbon emissions. Soil Cycles HVA – “Compost Collection on Two Wheels” – offers food scrap pick-up services to residential and business subscribers. Collected compostables are delivered to bins placed in the city by Black Bear Composting, which composts them. The returned soil matter can be used by subscribers or donated to community gardens or local farms. Since its first pickup on May 3, Soil Cycles has biked 529 miles to collect 1,461 pounds of compost, preventing 2,749 kg of carbon emissions, according to its website. Residents pay $25 a month for weekly pickup and supplies, and businesses pay according to their volume. Similar services are underway in 27 other states, all working to curb the more than 50 million tons of food sent to landfills each year in the United States, Vinod said. Read about Soil Cycles in Harrisonburg’s The Citizen. But Soil Cycles is about more than simply preventing waste. It seeks to “lift our local economy” with subscriber reward cards offering monthly discounts and deals such as free coffee at Shenandoah Joe’s – a perk for subscribers and an advertising boost for the vendors – and, eventually, by growing to become an employer, one that pays its workers livable wages. Riding bicycle is “a silent protest against fossil fuels,” Vinod said. Vinod, who grew up in Bengaluru (formerly Bangalore), India, has traveled for two and a half years to Central and South America, Japan, Nepal, Indonesia, Malaysia and elsewhere. The experience left her with an increased appreciation for the sustainability efforts of her grandparents, who on their farm in India grew their own food and planted coconut trees for oil. As a sophomore, she transferred from James Madison University – where art history professor Charles Maddox still encourages her in her environmental activism – to EMU after learning about its sustainability program’s “really good reputation” in the city and campus efforts such as the Sustainable Food Initiative and bicycle-powered recycling collection. “Once I looked at the campus and met some of the professors, I felt really inspired to be here and learn more in terms of peace and justice,” she said. Vinod and collaborator Amelia Morrison began laying the groundwork for Soil Cycles in 2017. 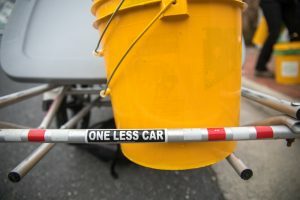 In 2017 she began laying the groundwork for Soil Cycles, along with JMU student Amelia Morrison and sustainability activist Taylor Evans, and she found EMU professors to be “very supportive.” A discrete math class taught by Professor Daniel Showalter devised efficient collection routes that avoided steep climbs and dangerous streets, and in a Python coding class taught by Showalter, and with input from Professor Stefano Colafranceschi, Vinod created a tool for looking up what is or isn’t compostable. 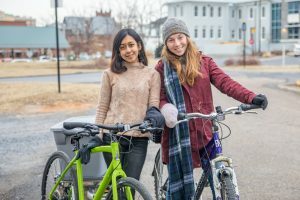 Vinod plans to remain in Harrisonburg following her graduation and to continue with Soil Cycles along with the team that has developed, which includes Kristen Grimshaw, Brian Nixon and Nolan and Quintin Peters. Great initiative, but most modern landfills collect and utilize the methane gas generated. Check out the EPA paper below on how Rockingham County did it. Warren last time I spoke with the Director of Rockingham County Public Works he said that our landfill had resumed flaring as RMH had stopped purchasing the gas collected (natural gas had a better price point).